Another step towards the realisation of a complete ‘sea to snow’ megalinkage has been taken with the proposal of an East Gippsland Forests National Park. 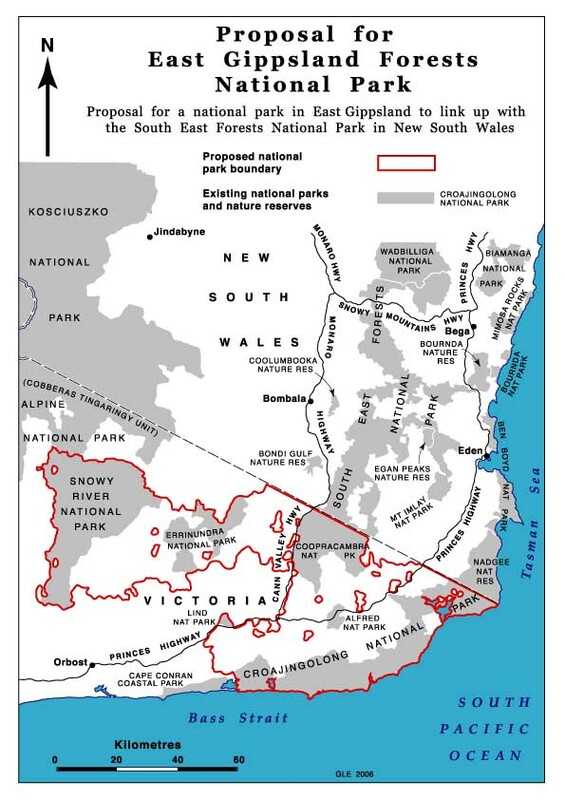 The proposal, published for the first time in this article (see map) involves joining up the six existing national parks in the region to form a super national park in much the same way as happened in New South Wales in 1997 when five national parks were merged and extended to create the South East Forests National Park. The new consolidated national park would double the size of the existing national parks in East Gippsland to a park of about 460,000 hectares and be contiguous with the South East Forests National Park. It would pave the way for a cross border greater forests national park similar to that which is being forged in the nearby alps. The potential of the project is immense. Nowhere else in the world is there such a display of the differences which occur with increased altitude in the eucalypt dominated sclerophyll vegetation. From the heaths and heathy woodlands right up to the snow gums and alpine herbfields there are already continuous corridors of protected areas between the national parks but these links are tenuous and vulnerable. They take the form of 184 special protection zones covering a total of 115,000 hectares in the area of the proposed new national park. These zones are better than nothing and form a basis for expansion but being narrow they are not secure either from an ecological or a land use point of view. Mistakes can occur over boundaries when logging occurs close by. The South East Forests National Park forms an excellent precedent for what is proposed in East Gippsland. Along with five other protected areas it provides a contiguous protected estate of 209, 221 hectares in the smaller region of the far south east of New South Wales. It gives the sea to snow transect a corridor from the sea additional to that which commences in the Croajingolong/Nadgee area. The new proposal has been developed by the Alps and South East Forests Working Group but it builds on proposals for national parks stretching back in time to 1923 in the case of the Mallacoota area. More particularly it expands on concepts developed by the ACF and the Victorian National Parks Association in the 1970s and 1980s. All of the protected areas within the boundary of the proposed park have been nominated for the National Heritage List as a first step towards World Heritage nomination. One of the great benefits of the new park is that it will improve the prospects for cooperative management of the forest parks of Australia’s south east corner. This year is the twentieth anniversary of the agreement concerning cooperative management of the alpine in parks. A similar arrangement for the forest parks is well overdue and the announcement by the Minister Bob Debus in September that he will work for an MOU for the forest parks is very welcome. But by far and away the greatest benefit of the proposal will be what will flow to the place itself and from there to us. In a secure national park with boundaries worthy of its international significance the natural vegetation will be able to evolve in response to natural factors including changes in climate and here will be a place where we can both enjoy the wonders of the place and be inspired to be environmentally more conscious than we are. Geoff Mosley, Coordinator Alps and South East Forests Working Group.